Google is bringing you a new Android feature that keeps the phone constantly unlocked as long as it’s in a person’s hand, resting on their leg or even just sitting in a pocket. 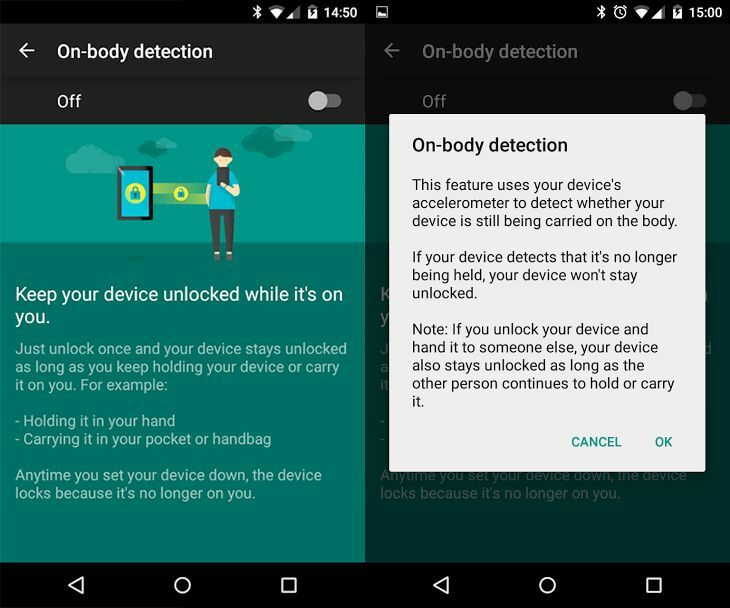 The ‘on-body detection’ feature uses the phone’s built-in accelerometer to know when it’s being handled or moved, and will only lock the screen when placed on a flat surface. The feature was first spotted by fan site Android Police in the Smart Lock menu of a Nexus 4 running Android Lollipop. Google said that if the user unlocks their device and hands it to someone else the phone or tablet stays unlocked as long as the other person continues to carry it. It is also unclear how active the screen will be in a pocket. On-body detection is the latest feature hoping to remove the need to enter security details regularly. Microsoft said devices running its Windows 10 software, which launches later this year, can be unlocked by looking at them, or using a fingerprint reader, while Apple made the fingerprint reader, or Touch ID, mainstream on its iPhone 5S and Samsung added a reader on its Galaxy S5.